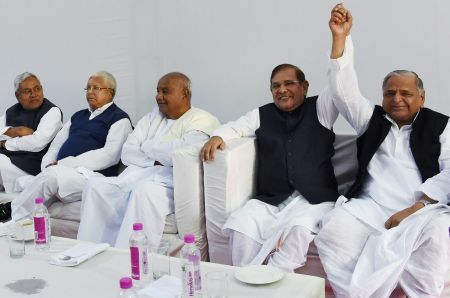 Sharad Yadav, president of the Janata Dal (United), is one of the architects of the proposed merger of six political parties who trace their roots to the erstwhile Janata Dal. Yadav tells Archis Mohan how the grand alliance with Left parties and even the Congress is the need of the hour. What is the aim behind this proposed merger? We are faced with a new political reality that has emerged because of the vacuum that resulted from the miserable failure of the second United Progressive Alliance government, and the splits in the Janata Dal. There is concern across the country in the manner the opposition numbers have plummeted. For the present, we have attempted at bringing about the merger of all those parties who were at ease with the idea. All of us are in agreement that a larger political party be formed as an effective weapon to rally the people of this country to prepare for future challenges. Why form one single party when, barring Bihar, these parties are not electoral rivals in their respective states? The objective of this merger isn't merely electoral politics. It is as much about several recent incidents, the kind of promises that were made during the elections, unprecedented use of money and the threat to social harmony in the country. Take, for example, the burning of a church in Delhi. This has never happened before in Delhi. I am not saying who the perpetrators were, but the fact is that such incidents are taking place. Our fight is against their extra-constitutional agenda. They speak in two voices. In Delhi, they talk about ‘sabka saath, sabka vikas’, but elsewhere some of their people talk about love jihad, others want missionary schools in tribal areas to shut down or students asked to address their teachers as acharya and not father. Their people talk about how not Gandhi but Nehru should have been assassinated. Communal tensions erupt just before an election. We do know who engineers such tensions. We have a prime minister who is turning mythology into science. The need of the hour is to build scientific temper among our people, not tell them how our ancient plastic surgeons sewed an elephant's head on the bust of a boy. Our leaders like JP (Jayaprakash Narayan) and (Ram Manohar) Lohia encouraged building scientific temper among people. They fought for Mahatma Gandhi's philosophy of daridra narayan -- to see the God in the poor and lowly. Then there is the question of farmers being denied their due and environmental concerns ignored to invite investments. Being market-friendly is important but not with total disregard for one's environment. With Narendra Modi redefining politics of backward caste assertion by claiming to be an OBC and a tea-seller, is there a need for the Janata Parivar to reinvent its political idiom of social justice? There is a huge gap in what they (Sangh Parivar) say on public platforms and what they do on the ground. The Bharatiya Janata Party didn't support the implementation of the Mandal Commission report. The caste that Modi hails from wasn't part of the original Mandal list. It was added to the state list of Gujarat; and to the central list during the Atal Bihari Vajpayee-led government's tenure. Secondly, caste is as old as religion. The caste system might witness changes from time to time, but it would be a big lie if somebody were to claim that it is no longer in existence. This time, they did win with their clever mix of religion and caste. But the struggle for social change cannot be achieved with pronouncements from the lectern. The Janata Parivar leaders are known for infighting and splits. This might be true, but at the same time, our sacrifices and struggle to work towards economic and social justice in India should also be acknowledged. The problem is our critics have little else to say about us or our icons. Can leaders like Ram Manohar Lohia or JP be accused of anything, or for that matter their successors like George Fernandes, Madhu Dandavate and Madhu Limaye? Our JD-U is one of the oldest parties from the Janata parivar. The exception of JD-U aside, most other parties in this new formation suffer from dynastic politics. Yes, dynastic politics is a question. But the bigger reality is social injustice. We are the only people who have consistently fought for social equity, including the V P Singh government, which implemented the Mandal Commission report. That cost us the government as BJP started shilanyas in Ayodhya, Lalu Yadavji arrested L K Advani in Bihar. We sacrificed our government for the cause. Do please recall that as well when you remember our toot-phoot (splits). Our efforts have brought some of the most seminal changes in Indian politics, whether the Samyukta Vidhayak Dal governments of 1967 or the JP-led Janata Party experiment of 1977 or the fight against social and economic inequality. Apart from the six, are there any other parties that could join? I am discussing with others and you would come to know when the talks reach some conclusion. The Left parties aren't separate from us. They are happy at this development. They wanted us to join hands. People in the Congress have also welcomed it. A united Janata Dal will give a voice to the concerns of the majority, as its natural support base comprises peasants and workers, while the BJP's primary base is from upper sections of our society. The Congress party supports many of the economic policies of the government. Can it be an effective partner of this grand alliance? Today's Congress isn't what it used to be. This isn't the Congress of the times of Lohia and JP. What about the Mamata Banerjee-led Trinamool Congress? I believe there is a genuine problem in some states. Mamataji is a mass leader of Bengal. Left parties are also important there, as is the Congress. The situation is complicated there, as it is in Tamil Nadu, Andhra Pradesh and Maharashtra. We think that more and more like-minded parties will join us when they see their (BJP and Sangh Parivar's) taur-tarike (words and actions). It isn't about getting a political party in each state to join us but to consolidate as many of the 70 per cent votes that didn't vote for the BJP. Even 40 per cent (of the 70 per cent) coming together will be enough. The Socialist Party of old had a strong cadre across North India, but not anymore. Your fight, however, is with a strong cadre-based party. It took them (the Rashtriya Swayamsevak Sangh) long to come to power. We have formed governments at the centre much before they could. JP was the catalyst for the government in 1977, then the V P Singh and Chandra Shekhar governments as also the United Front government in 1996. Yes, these didn't last long but they (BJP and RSS) had their cadre even then. Today, what they have is unprecedented corporate support. Such a union of politics and corporate has never happened in the past. Their funding has come from all kinds of places. I do acknowledge this absence of a strong cadre. But we have formed governments in the past and that couldn't have been achieved if there was no strength in our ideology. Here's Yotaphone, the world's first dual-screen phone!